Vedantu.com - No.1 online tutoring company in India provides you the Free PDF download of NCERT Solutions for Class 7 Science Chapter 16 - Water: A Precious Resource solved by Expert Teachers as per NCERT (CBSE) Book guidelines. 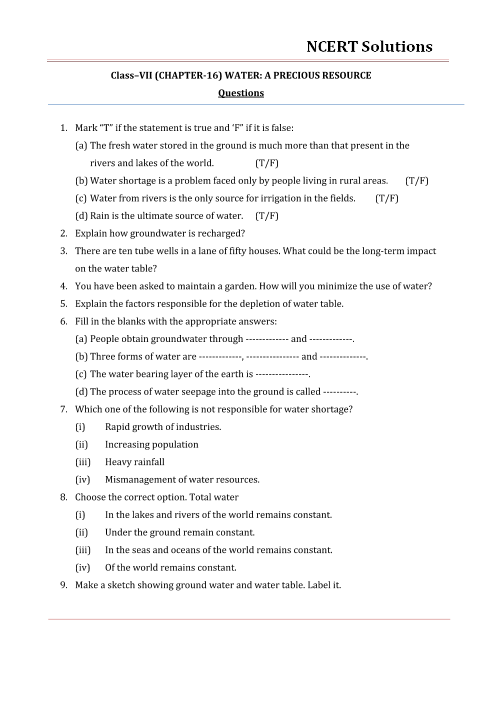 All Chapter 16 - Water: A Precious Resource Exercise Questions with Solutions to help you to revise complete Syllabus and Score More marks. Register for our free webinar class with best Science tutor in India. NCERT Grade 7 Science Chapter 16, Water: A Precious Resource addresses one of the most important necessity of life on earth- Water.How Much Water Is Available, Forms Of Water, Groundwater As An Important Source Of Water, Depletion Of Water Table, Distribution Of Water, Water Management, What Role You Can Play and Effect Of Water Scarcity On Plants are some of the important topics discussed in this chapter. A chapter based on Environmental Awareness, it alarms the students about the availability of water on earth. Facts and to-do activities make this section alarming yet interesting to learn. The section also discusses wise use of water for daily activities to prevent wastage and scarcity of the precious resource. The concept of Water Cycle discussed in the next section also helps to understand the various forms of water available on earth.The next section of NCERT Grade 7 Science Chapter 16, Water: A Precious Resource throws light on Groundwater as an Important Source of Water. It discusses the hardships faced by the people due to water scarcity in different regions of the country. It suggests ways to conserve groundwater. The chapter further discusses about the conditions leading to water scarcity and its effects on the people. Population growth, depletion of the water table, non-monitored agricultural activities and industrialisation have led to the scarcity of water.The chapter concludes by suggesting ways to manage water usage and individual contribution towards water conservation. Get 100 percent accurate NCERT Solutions for Class 7 Science Chapter 16 (Water: A Precious Resource) explained by expert Science teachers. We provide solutions for the questions given in Class 7 Science textbook as per CBSE Board guidelines from the latest NCERT book for Class 7 Science. The topics and sub-topics in Chapter 16 Water: A Precious Resource are given below. Ex 16.8 - EFFECT OF WATER SCARCITY ON PLANTS. Chapter 16 - 9 Questions with Solutions. Other than given exercises, you should also practice all the solved examples given in the book to clear your concepts on Water: A Precious Resource. Download the free PDF of Chapter 16 Water: A Precious Resource and take the print out to keep it handy for your exam preparation.